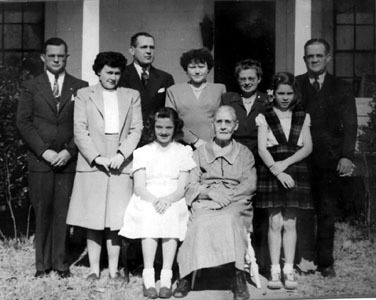 left to right: Emmett James Culpepper and his wife, Alice Carter Culpepper; Joseph Ernest Culpepper and, his wife, Laney Susan Eugenia Acklen Culpepper; Ernestine Dorothy Owens Culpepper, Ella Rebecca Culpepper Benson and William Pinckney Culpepper. In front: Dorothy Gene Culpepper and Martha Ella Harris Culpepper. Obituary of Jim Culpepper (#2487), published 28 Mar 1985.
Who's Who in America, 35th Ed., 1968-1969, Chicago, Illinois: Marquis-Who's Who, 1968, Repository: LDS Family History Library - Salt Lake City, Call No. US/CAN 973 D36w 35 ed. Ph.D., Psychology, University of Rochester, Rochester, NY. Obituary* 7 Mar 2009� Carmen Culpepper Hammack, after a lengthy illness, went to be with the Lord on Thursday, March 5, 2009, at her home in Hattiesburg. Services will be held in Quitman at the First United Methodist Church today at 3 pm. Visitation will be held prior to the service at 12:30 pm at Wright's Funeral Home. Burial will be in the Oddfellows Cemetery. Carmen grew up in Quitman, MS and graduated from MSCW in 1968. While living in Quitman, Carmen served as Treasurer of her church. She also lived in Laurel for several years where she was a member of the First United Methodist Church and served as President of Laurel's Junior Auxiliary. She has lived in Hattiesburg for the last twelve years and is currently a member of Main Street United Methodist Church of Hattiesburg. She is preceded in death by her parents, Jim and Alice Culpepper. Survivors include her husband, John Campbell Hammack; two cousins, Celia Muths of Gulfport and Becky Benson of Kansas City; and numerous nieces and nephews. Nettie Blan, Dau, F, Sng, Wh, 32, N/A, AL/GA/GA. J. H. Culpepper and Callie Callett married 15 Jan 1885 in Lauderdale Co., MS.
Beulah Culpepper and J. W. Ross married 31 Jan 1887 in Lauderdale Co., MS.
Anna Culpepper and Ancel Smith married 22 Sep 1889 in Lauderdale Co., MS.
R. L. Culpepper and Ellena Merritt married 7 Nov 1897 in Lauderdale Co., MS.
Erica Merritt, Sister-in-Law, Wh, F, Feb 1884, 16, S, MS/MS/MS. Nancy E. Culpepper, Daughter, F, Wh, 5, S, MS/MS/MS. L. S. Culpepper and Jennie Pigford married 6 Dec 1899 in Lauderdale Co., MS.
Jenie Culpepper, Wife, Wh, F, Jun 1880, 20, Md-1 yr, ch 0/0, MS/MS/MS. Archie S. Culpepper, Son, M, Wh, 1, S, MS/MS/MS. Fred D. Culpepper, Son, M, Wh, 6, sng, MS/MS/MS. Mark Conn Jr, Nephew, M, Wh, 6, sng, MS/MS/MS. Cassie Hall, Roomer, F, W, 21, sng, MS/MS/MS, shirt factory. Ernestine Culpepper, Daughter, F, Wh, 25, sng, MS/MS/MS, Beautician, Beauty Parlor. Arlas Lafayette Culpepper, 912 9th St., Meridian, Lauderdale Co., MS, Age 43, Born 10 Jan 1874, White, City Salesman for A. J. Lyons & Co. at 25 Front St., Meridian, Lauderdale Co., MS. Nearest relative: Mrs. Myrtle H. Culpepper, Wife, 912 9th St., Meridian, Lauderdale Co., MS, /s/ Arlas Lafayette Culpepper, Medium height, Slender build, Gray eyes, Sandy hair, No disabilities. Registered 12 Sep 1918 in Meridian, Lauderdale Co., MS. The Rev. Chuck Culpepper leads St. Alexis Episcopal Church in an old warehouse in downtown Jackson, Miss. In 2006, St. Alexis became the first church opened by the Episcopal Church in Mississippi since the 1960s. "It began with an idea our bishop had," Culpepper said, to appeal to "unchurched" young adults -- those who have no church home and are unlikely to go to the more common big, old church. The building they picked most recently housed a furniture store. The congregation renovated the structure, which was built in the 1920s, but the goal was to keep the industrial look -- exposed brick, high ceilings. "We didn't want for it to look like a church," Culpepper said. St. Alexis parishioner Nic Torrence, 26, of Jackson said "he came to the church with a friend a few years ago, not really knowing what to expect. Source: Elizabeth Crisp, God's Politics' Blog, "No Pews, No Suits, No Problem", Sojourners, http://www.sojo.net/blogs/2012/02/14/no-pews-no-suits-no-problem/. Ilitia F. Culpepper married J. W. Shoemaker on 27 Jan 1890 in Sumter Co., Alabama. Francis H. Culpepper and Daisy M. Baxter married 30 Jul 1895 in Hancock Co., MS.
+ Spinks Hardin, Oct. 11, 1858 - Apr. 23, 1917. Mary E. Culpepper married Spinks Hardin on 24 Jan 1882 in Sumter Co., Alabama. a. Virginia Elizabeth Willis, b. 7 Nov 1916, m. John Riley Mitchell in Mobile, Al on 7 Jan 1948. He had peviously served in WWII. They had a daughter, Barbara Joan Mitchell, who never married, has no children, and lives in Birmingham, AL. b. Jeanne Anne Willis (living in 2011), m. in Mobile, Al on 6 June 1948, Donald Makepeace Mason, who also served in WWII. They had 3 children: Edith Anne Mason, Donna Ruth Mason, and Cynthia Lee Mason. Donald previously had a child, Priscilla Jane Mason, with Alice Bell McCutcheon. + Martha Culpepper Willis, Sept. 13, 1856 - Nov. 10, 1890 (Wife of Abner Willis). Martha Culpepper married A. A. Willis on 29 Jan 1880 in Sumter Co., Alabama. M. Culpepper and A. A. Willis, "Married recently in Sumter Co., Alabama". Published 20 Feb 1880, Vol. 3, page 607.